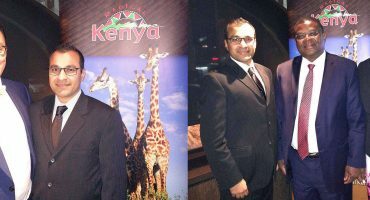 Best Time & Weather To Travel To Masai Mara? 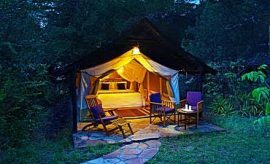 Scroll Down For Details..
Masai Mara National Reserve is an extraordinary wilderness travel destination in south-western Kenya that offers an ideal climate and exceptional year-round game viewing. The average daytime temperatures remain quite comfortable while the nights are much cooler. The average daytime temperature is around 77 F (25 C) from June to August while the nighttime lows are around 50 F (10 C). The average daytime temperatures range from 79 F (26 C) to 82 F (28 C) in September through May, and the temperatures drop at night to lows of 55 F (13 C). 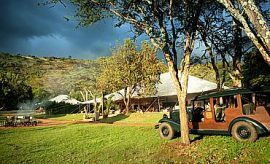 The Mara offers ample daylight of around 12 hours for all of your outdoor African safari vacation activities. 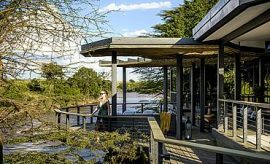 While these conditions make for a magnificent game viewing any time of year, AfricanMecca advises its visitants of weather patterns that may influence their chosen time to visit the reserve. 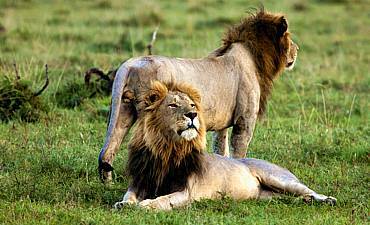 Like other locations in Kenya, Masai Mara Reserve experiences two dry seasons and two rainy seasons. 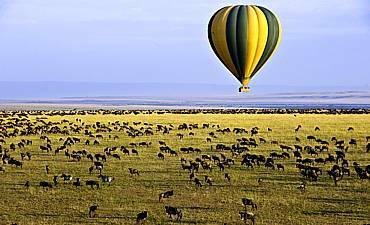 The presence or absence of rainfall affects vegetation and water sources thus affecting the movement and concentration of animals. 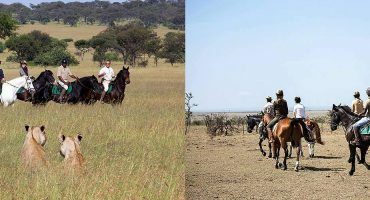 When these resources are scarce, wildlife traverse from the deep interiors to more open areas in search of food and also converge to permanent or last-remaining water sources especially the Mara and Talek Rivers. 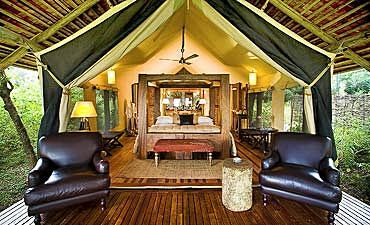 Safari game viewing in the Mara is optimal at this time as there is the greater wildlife visibility with less tracking time needed. Additionally, road and trail conditions are adverse to wet weather with the black cotton soil being a welcoming host to vehicles during the rains. 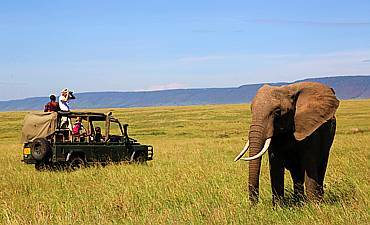 The long cool-dry season from July to October is considered by most to be the best time of year to visit Masai Mara but also costliest season too. The absence of rain means that the flora is less dense, so animals are easier to observe. Additionally, insect levels, including mosquitoes, are lower during the dry season. 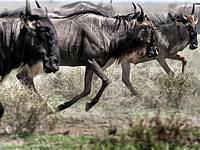 The long dry season also corresponds to the Great Migration that arrives in Masai Mara from the Serengeti National Park (read more on the Tanzania side of the migration). 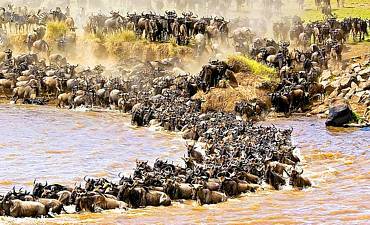 Approximately 1.5 million wildebeests and hundreds of thousands of zebras, elands and gazelles cross the crocodile infested Mara River in the reserve in search of food and water. 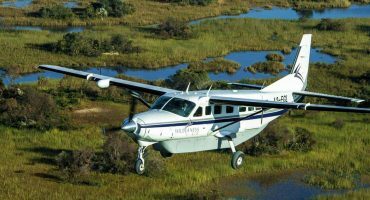 Although their arrival varies from year-to-year, in general, the herds arrive in late July through August and also parts of September. 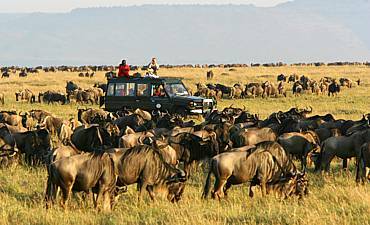 Road conditions are excellent for game viewing allowing you to see varied terrestrial fauna including massive gnu herds up-close and personal. With a high number of prey animals speckled across the reserve, predators are actively seeking out their next meal with the easiest catch being riverside once the wildebeests have crossed over. One of their most sought-after preys for feline cubs testing their hunting skills may be a newborn gazelle or impala or another young mammal. 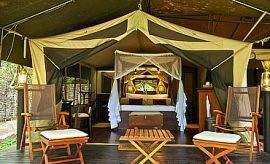 The long dry season in the Mara does have some shortcomings. International tourist arrivals levels including AfricanMecca guests are highest during this time of year, so you may see more safari vehicles and signs of human presence than other times of the year but the Masai Mara has opened up to private conservancies, so guests and vehicles are limited in these regulated, low ratio areas thus the effect is lessened but not diminished. November and December mark the short rainy season. Visitor levels generally fall somewhat during these months, with the exception of Christmas and New Year’s. 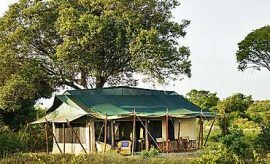 The rains bring new life to the plains in both food sources and water, so many animals return slightly more inland into the bush and forest wilderness. Road conditions remain fair as the moisture evaporates quickly in equatorial Kenya.